30 August 2016, 16:04 p.m. 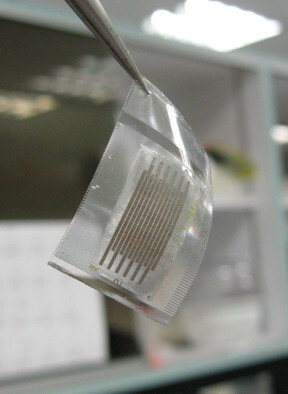 The supercapacitor (left) utilises out-of-plane wavy structures made of graphene micro-ribbons, and is structured so that the stain concentration on the electrode fingers is reduced. This prevents the cracking and detaching of electrode materials and keeps the electrode fingers at a relatively constant distance, maintaining the stability of the micro-supercapacitors. This structure solves the challenges of traditional batteries, which are thick and rigid and not suitable for small, malleable wearables. Xiaodong Chen, Ph.D, said: "Most power sources, such as phone batteries, are not stretchable. They are very rigid. My team has made stretchable electrodes, and we have integrated them into a supercapacitor, which is an energy storage device that powers electronic gadgets." Supercapacitors have reduced in size significantly since their first development in 1950s. Today's computers, cell phones and other devices use two-dimensional micro-supercapacitors, but they remain rigid to this day. The research team looked into graphene-based supercapacitor. This carbon material is popular for its conductivity, strength and thinness, but cannot be stretched. To solve this challenge, the team looked at the wave-like microstructure of skin and sought to apply that to form graphene micro-ribbons. The micro-ribbons were placed into the pyramidal ridges of a stretchable polymer chip, forming a wave-like structure. Kirigami structures were developed to make the supercapacitor 500% more flexible without impacting electrochemical performance. The researchers aim to increase the surface area of the electrode in future experiments to store more energy. In its present form, the graphene supercapacitor can only power LCD devices for one minute. The presentation of this new technology comes weeks after the Korea Advanced Institute of Science and Technology (KAIST) designed and developed new ultra-thin transistors for wearable and electronic displays. The arrival of graphene supercapacitors and ultra-thin TFT arrays seem to indicate technology is racing forward to meet demand for transparent and flexible wearable displays increases in the modern, IoT-empowered world.